In between gorgeous morning sunlight pouring over miles of mountain skyline and magical starry skies with the moon hanging over the dark shadows of the rolling peaks, guests to Mt. 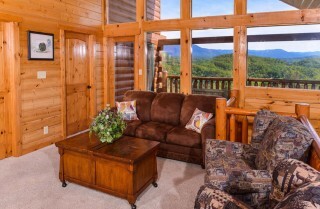 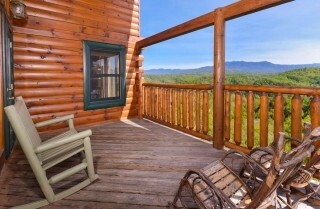 LeConte Views Lodge are privileged to all the best perks of a Smoky Mountain large lodge stay with Cabins for YOU. 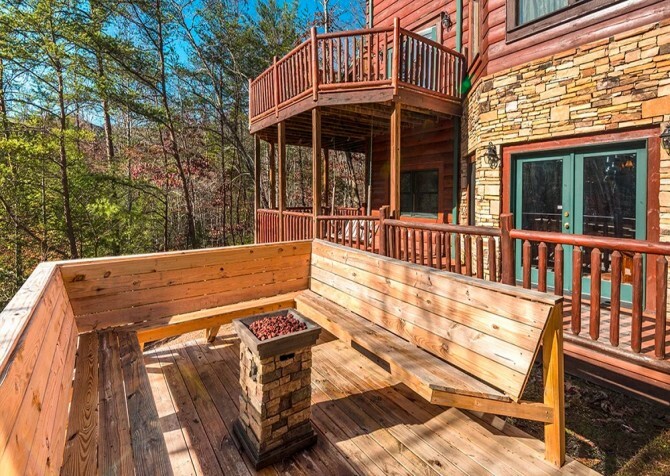 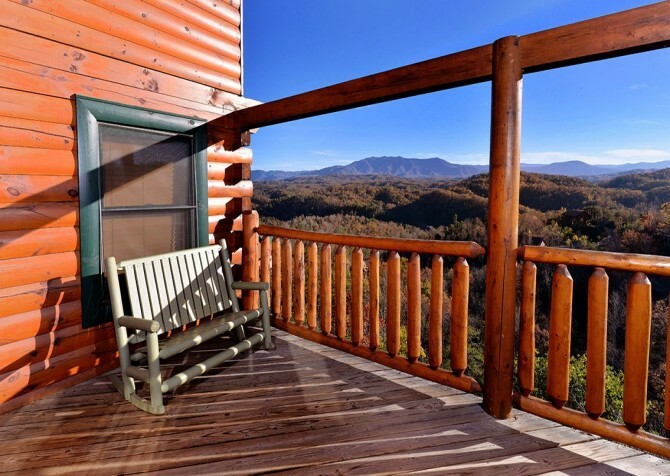 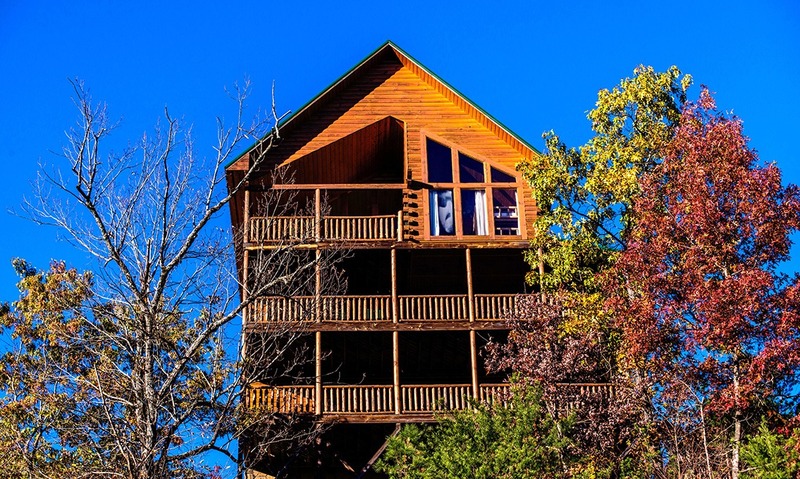 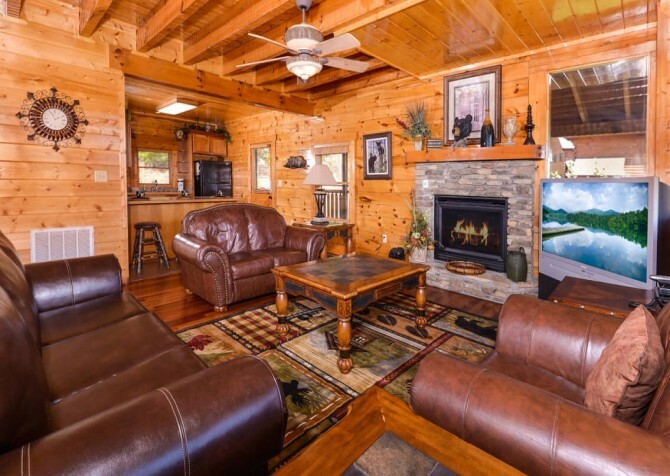 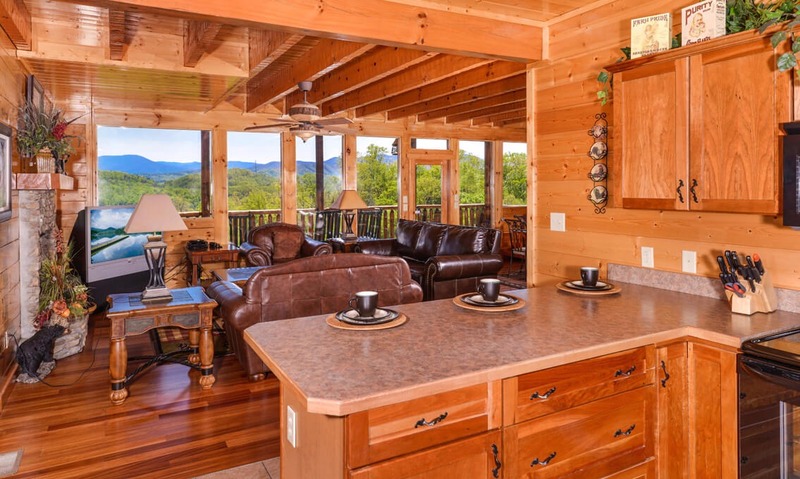 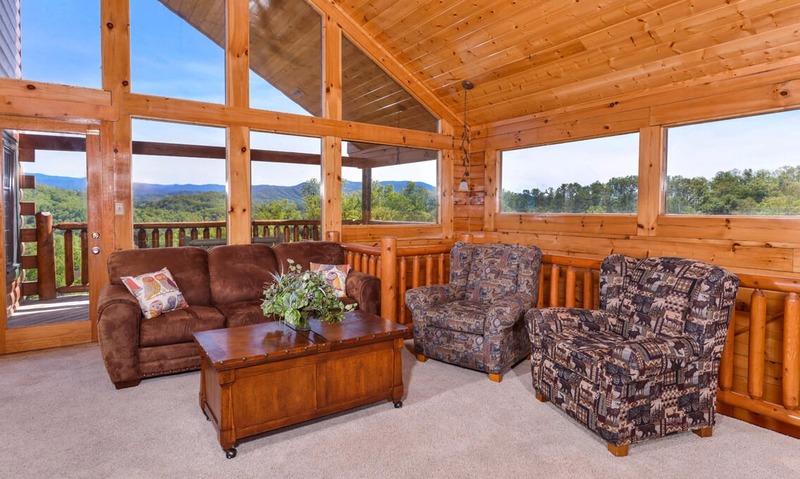 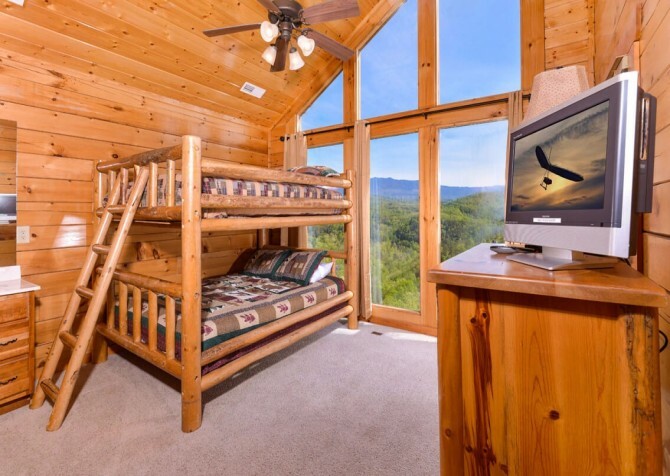 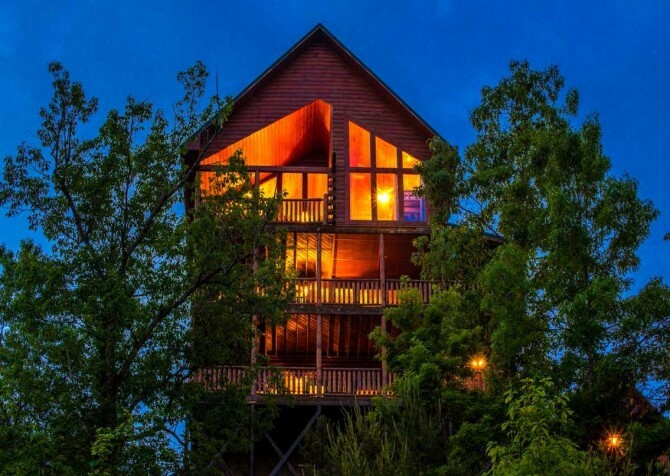 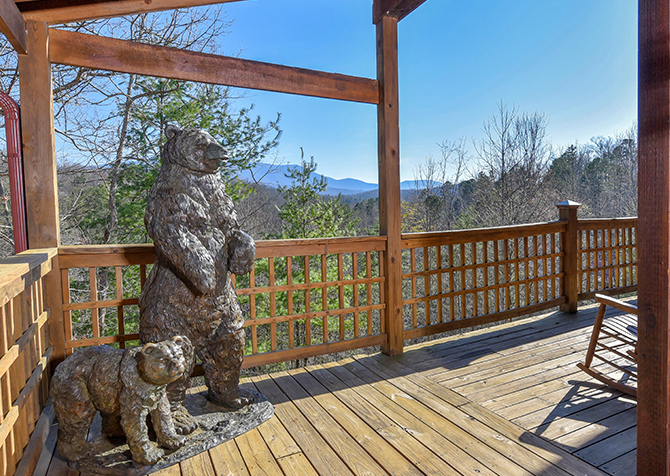 Spend your mornings slowly crawling out from the covers of cozy king and queen-size beds of the 5 bedrooms before brewing coffee in the fully loaded kitchen and enjoying your fresh cup of joe on 1 of 3 decks overlooking breathtaking views of the Smoky Mountains. Inside, there is plenty of space for up to 21 guests to kick back and unwind in front of a quiet fire in the living room, watch movies on the large flatscreen TV with theater seating in the rec room, or read books in the cushy seating of the loft sitting room with gorgeous views through the expansive windows. 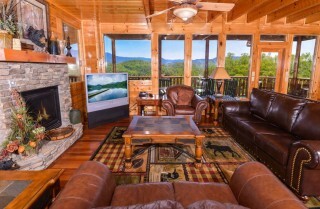 There are 9 TVs – all with HDTV throughout the cabin; 8 have DVD players hooked up or built in. 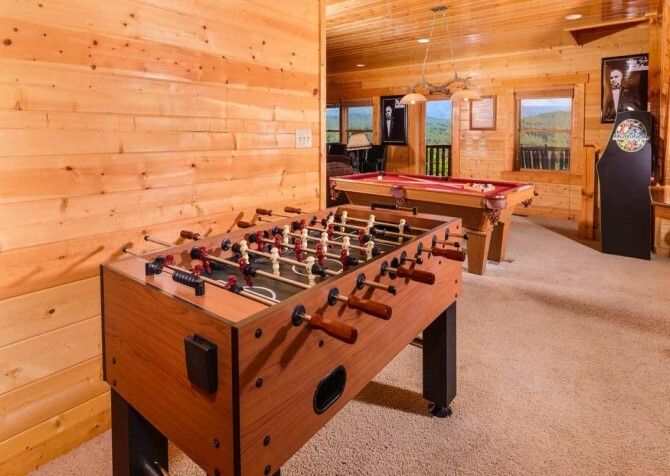 It’ll be easy to keep everyone entertained! 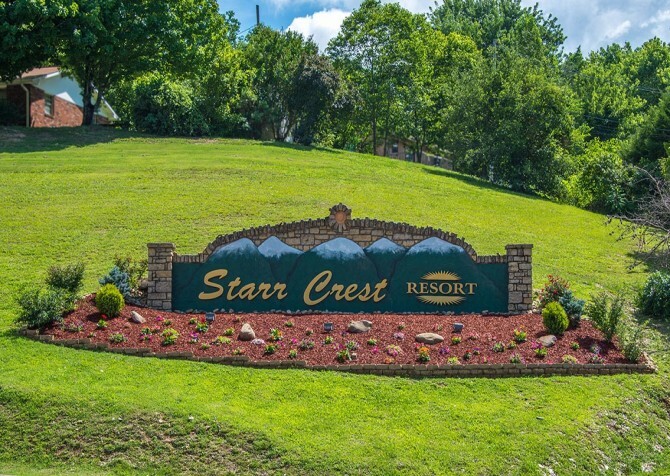 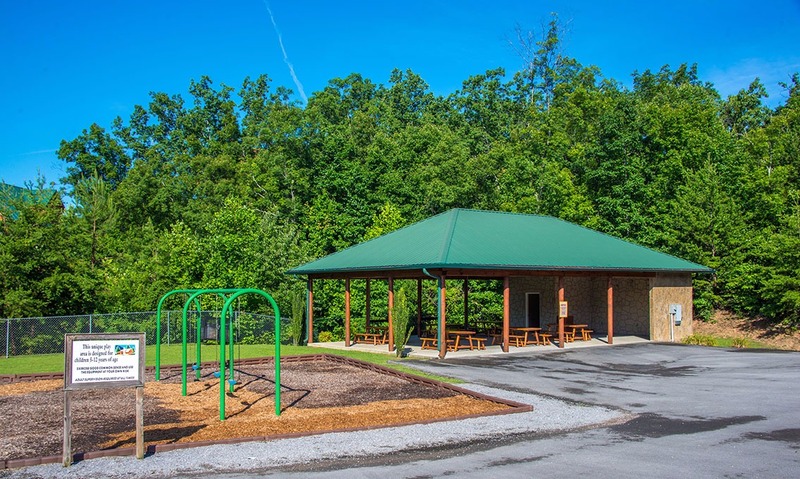 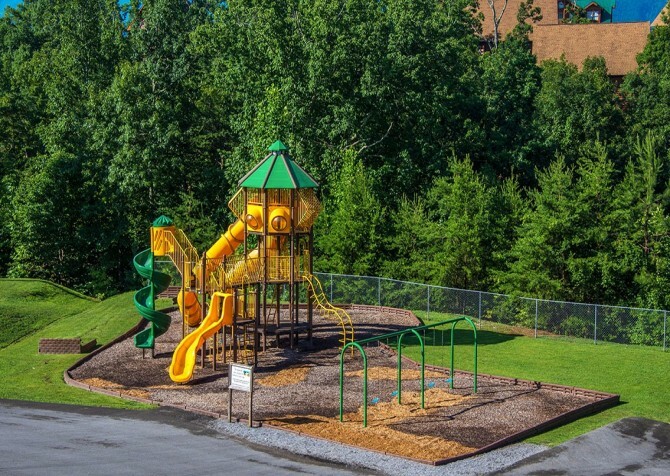 Under 3 miles from downtown Pigeon Forge, Starr Crest Resort boasts convenience and fun with an impressive playground the kids will love. 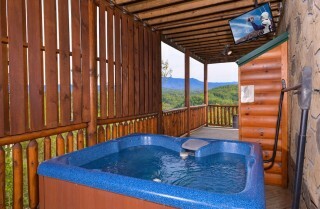 After scenic waterfall hikes through the Great Smoky Mountains National Park, soothe tired muscles in the outdoor hot tub while watching a movie on the deck’s flatscreen TV. 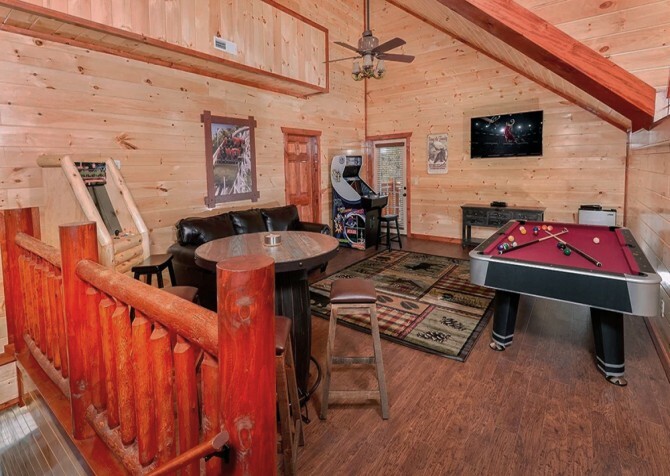 Hang out together in the evenings while playing pool, air hockey, and foosball by the wet bar in the rec room before turning in for restful nights of sleep in the cozy settings of your bedrooms. 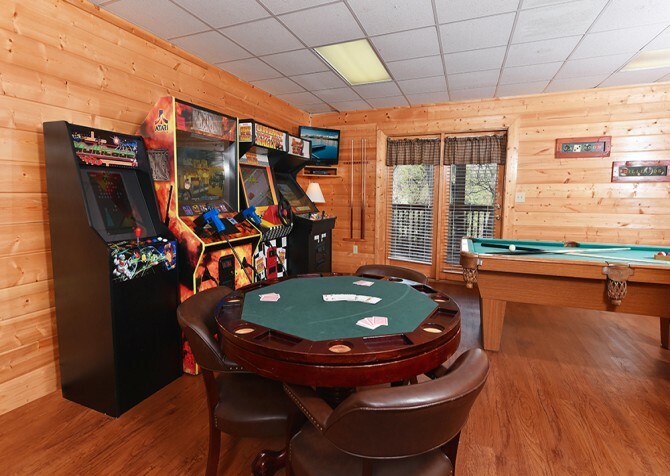 With so many awesome amenities in the cabin and hundreds of attractions like Dollywood, Foxfire Mountain Adventure Park, and Ripley’s Odditorium nearby, Mt. 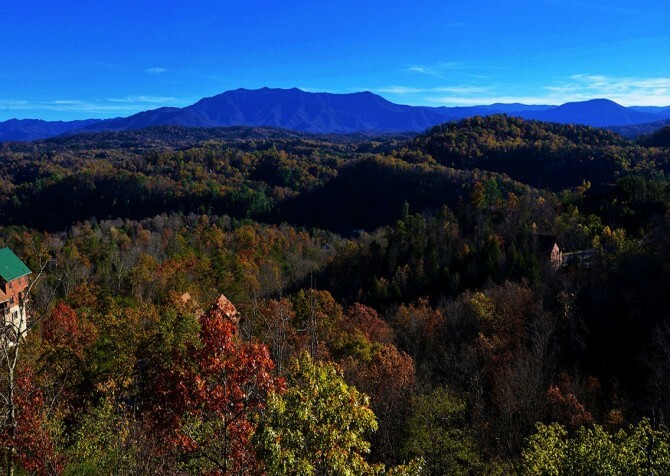 LeConte Views Lodge lends guests the ultimate in relaxation and excitement while staying in the beautiful Great Smoky Mountains. Family time is encouraged in the spacious living room with oversized leather couches, a large coffee table, lovely stacked-stone fireplace, and amazing mountain views through the windowed walls. Host game nights with your favorites from home, teaching and learning new games while seated around the coffee table, sipping local wines, as a warm fire burns beyond the hearth. Enjoy afternoons of daytime TV in between excursions while lounging on the plush sofas and snacking on leftovers from downtown. 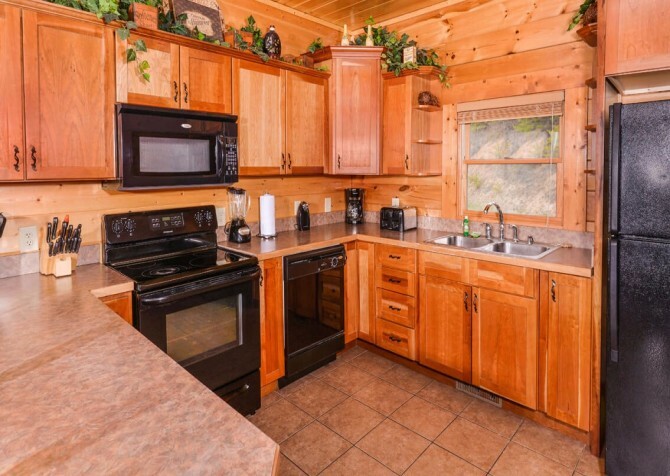 Sleek black appliances, spacious countertops, charming 3-seat breakfast bar, and every tool you need to prepare delicious meals awaits guests in the large, open kitchen of Mt. 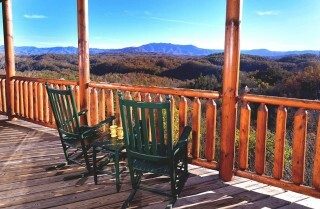 LeConte Views Lodge. 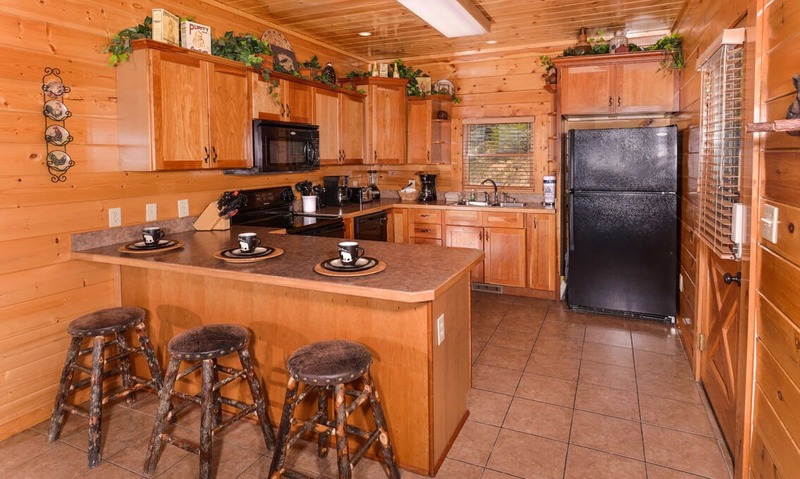 Put together quick breakfasts in the toaster oven or a fruit smoothie in the blender before running out the door to begin shopping in The Old Mill District or the Sevierville Tanger Outlets. In the mornings, a fresh pot of coffee is just minutes away in the coffeemaker. 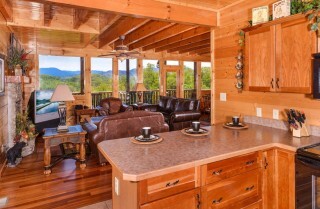 Store leftovers, groceries, and bottles of dessert wine from the Smoky Mountain Winery in your full-size refrigerator. 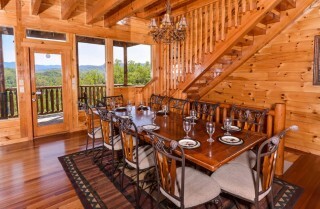 Cooking for a group will be a breeze here, with all the tools you need at hand! Gather around the impressive 10-chair dining set under the antler chandelier where good food, good times, and great views are to be enjoyed on a daily basis in Mt. 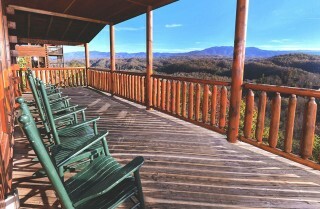 LeConte Views Lodge. 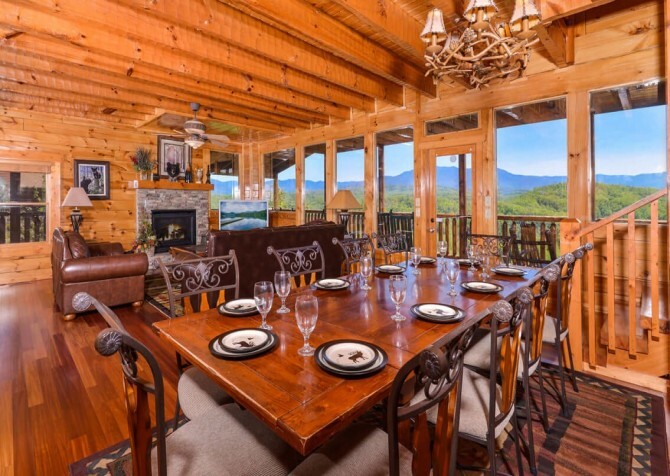 Set up self-serve buffets on the nearby breakfast bar or place large serving bowls around the table for a family meal while dining together during the holidays or after a small wedding ceremony in one of the numerous Smoky Mountain wedding venues. 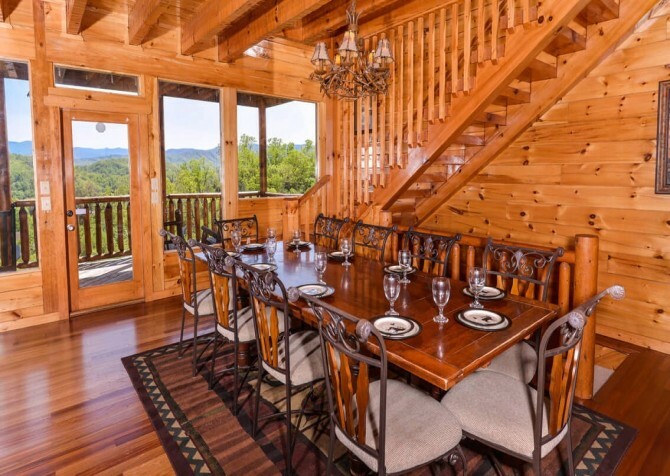 Toast to friend reunions under the warm light of the chandelier before clearing the table and sharing laughs late into the night. 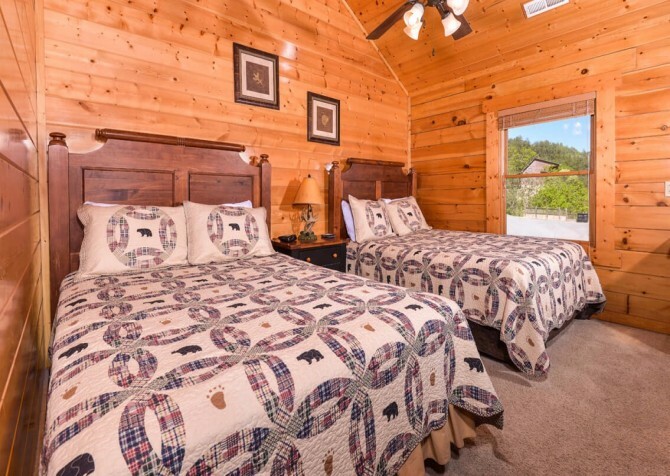 Every guest will feel right at home in the 5 cozy bedrooms boasting cozy furnishings, TVs with built-in DVD players, and direct access to 4 bathrooms. 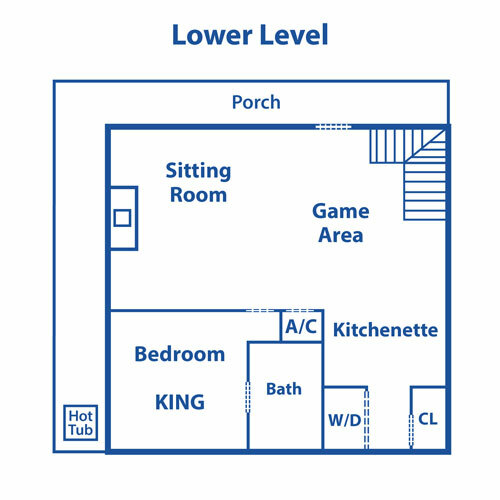 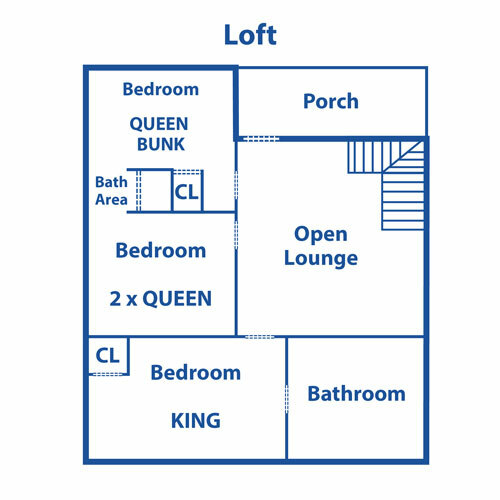 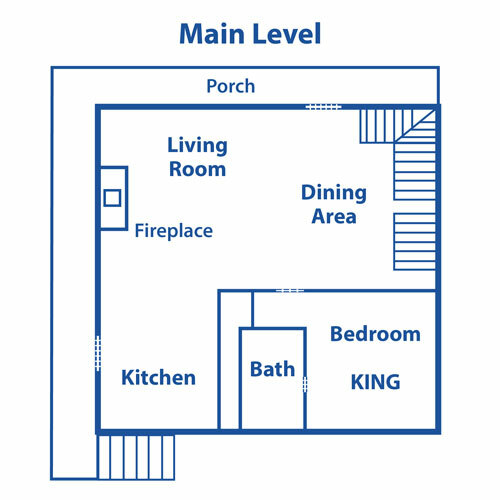 Three suites with king-size beds are found on each floor with the last 2 bedrooms in the loft housing queen-size beds, a shared bathroom, and a cozy lounge area with peaceful mountain views through the large loft windows and quiet deck with rocking chairs. Guests will love hanging out and relaxing together in the lower level’s impressive rec and theater room! 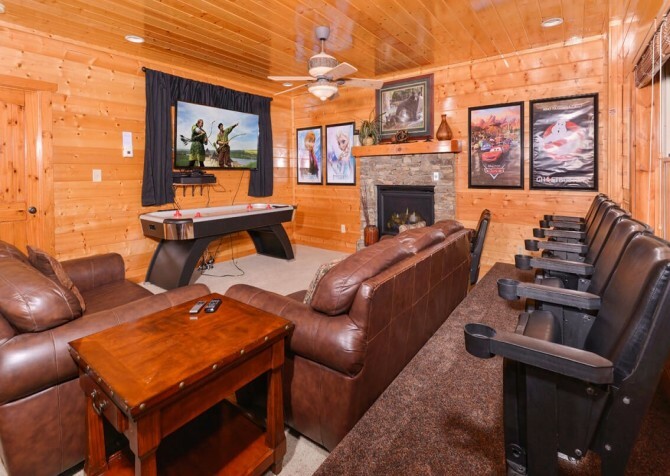 Skip the expensive trip to the movies, pop your own buttery snacks in the nearby kitchenette, and screen your film on the large flatscreen TV with prime seating on the plush leather sofas and tiered theater seats with cup holders. 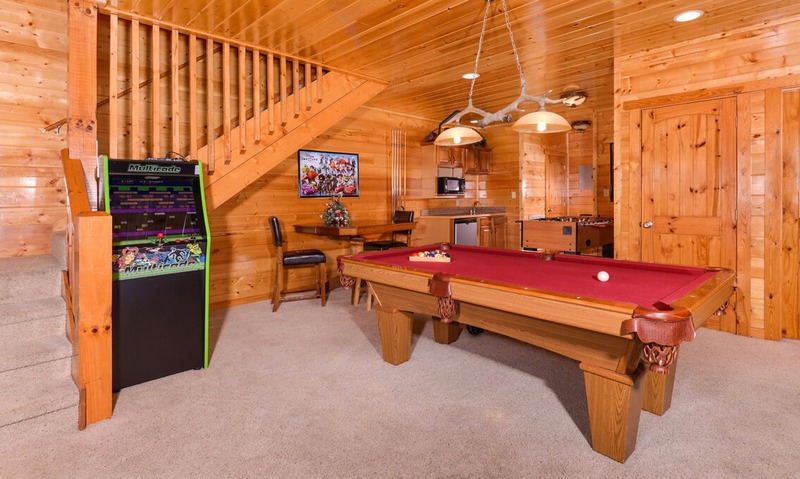 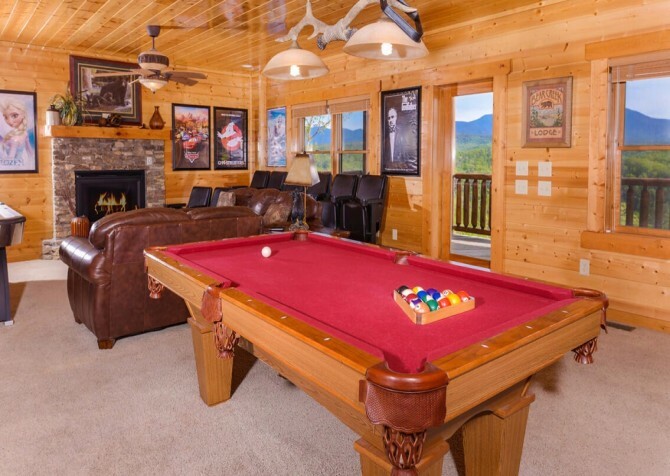 Sip on local beer from your Smoky Mountain Brewery stored in the wet bar in between turns on the pool table, air hockey table, or the XBox 360. Teach the younger ones a thing or two on the retro arcade gaming system or have a team competition on the foosball table. 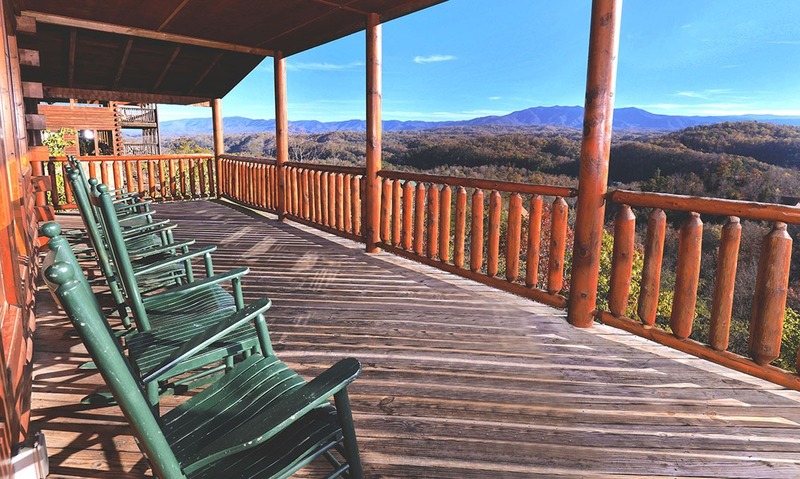 With views like these and great outdoor amenities, don’t be surprised when you find most of your time is spent on the 3 decks of Mt. 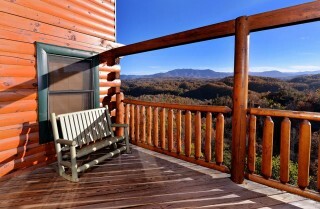 LeConte Views Lodge! Sip on hot cups of coffee each day while leaning back in your rocking chairs and listening to the lovely morning songs of the birds as the early sunlight crawls over the mountain peaks. 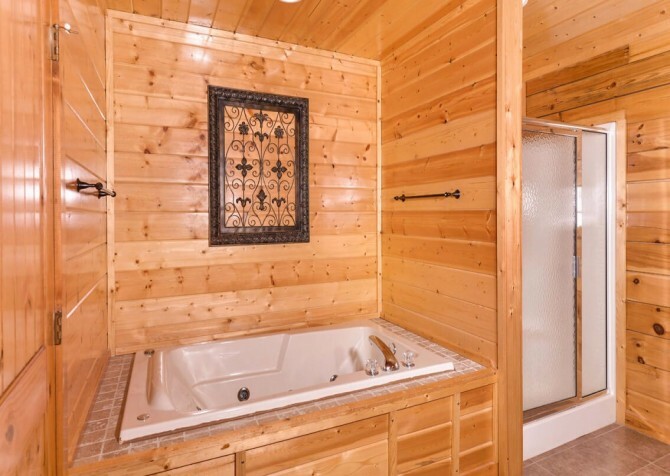 Break out the brews and the brats before firing up the charcoal grill to host a cabin cookout or let the wee hours of the night slip by while enjoying a soothing soak in the outdoor hot tub with a TV above it! Once the center for community and commerce and the original resting place of the impressive iron forge for which the city gained its name, this historical grist mill built in the early 1800s is a hallmark of Pigeon Forge and a great stop for food, shopping, coffee, and sweet treats. 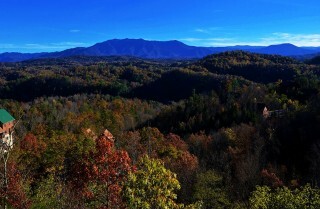 Numerous trails, ranging in length and difficulty, meander throughout the beautiful Great Smoky Mountains, such as the paved Gatlinburg Trail, scenic Cades Cove Loop Road, and the babbling streams of Lower Deep Creek Trail, so, be sure to pack your bikes or visit the Cades Cove store to rent! 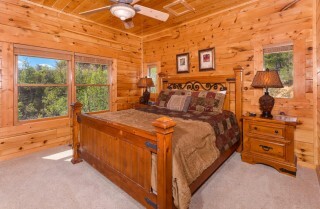 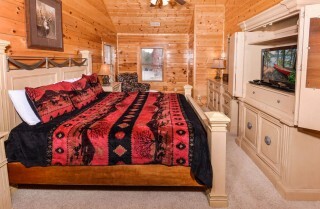 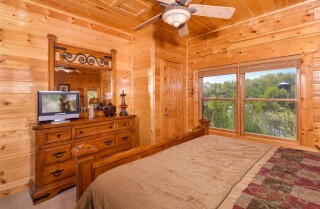 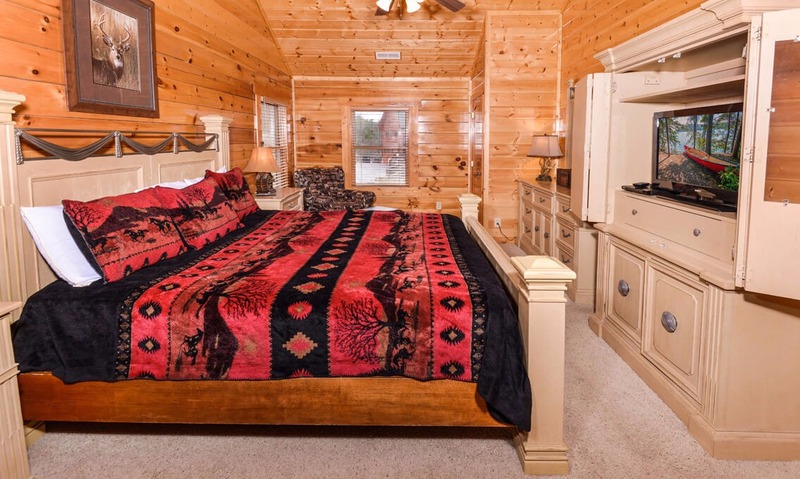 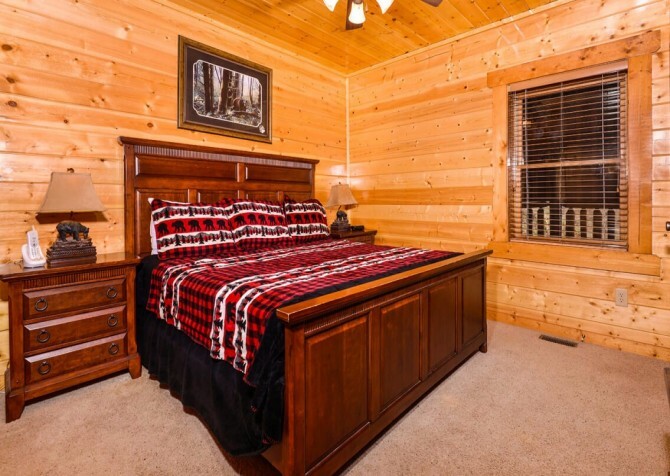 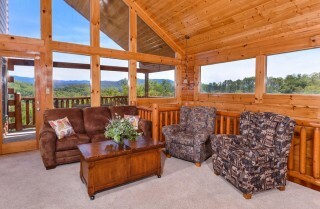 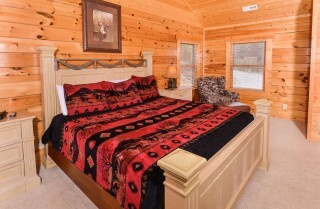 While staying in one of Cabins for YOU’s impressive large lodges, like Mt. LeConte Views Lodge, having everyone together for an intimate wedding is much less stressful than other destination weddings and, not to mention, the backdrop is gorgeous! 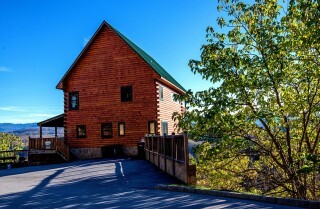 Many venues even do all the planning for you! "Great cabin. 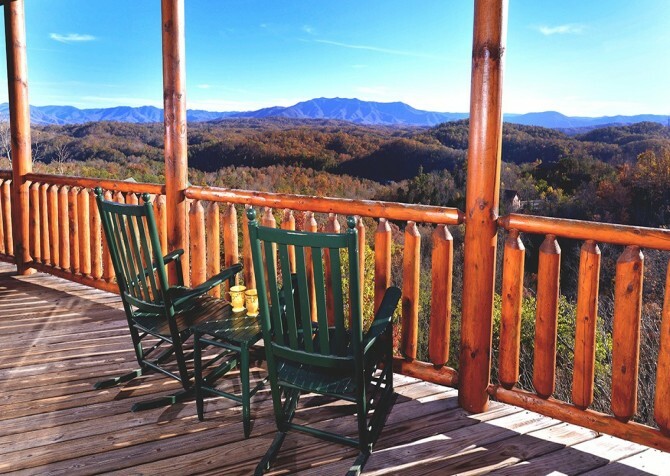 Everything was perfect, easy to find. 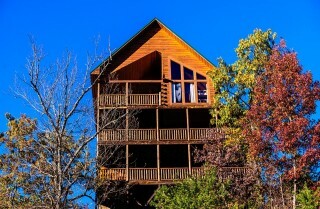 I highly recommend this place to stay! My family was extremely pleased with our stay here. We look forward to returning year after year!"